Beavis and Butthead is coming back to MTV, and this may seem like a strange association, but I sampled this Mintia in honor of their return. If you weren't around during this particular era, the dynamic dimwits used to hawk Mintia in Japan. 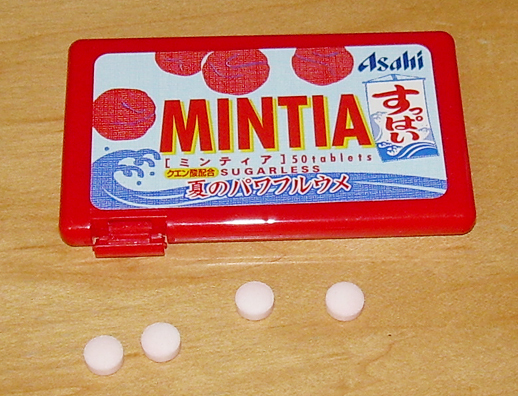 I'm not really much of a mint fan, which is odd since I've become such a gum fan and the two tend to go hand in hand and I never tried Mintia before this. However, I do like Beavis and Butthead, and you can reach whatever conclusions that you like about me as a consequence of that admission. I'm secure enough in my intellect not to feel that liking really dumb comedy reflects poorly on me. Really. I'm not insecure. Nope. I chose this flavor because it's about as Japanese a flavor as one is going to get. There are little blobs of what look like umeboshi (pickled plum) dancing over a Hiroshige-style wave. The little banner on the right is reminiscent of those that hang outside of shops, particularly when they advertise Japanese shaved ice (kakigori). I found this at Family Mart convenience store for 120 yen ($1.54) and snapped it up in a rush before heading back to work. Plum can be a bit of a risky flavor in Japan, as I learned when a student once gave me a hard candy flavored with "ume". It was a horrendous mix of sour vinegar flavors and sweet sugary flavor with harsh plum. When I popped the top on this, it smelled funky, but also familiar. I recognized it as a scent reminiscent, but far from identical to umeboshi. This was worrying, but I gamely tried them anyway. Each mint is extremely tiny. In fact, I'd wager they are 1/3 to 1/2 the size of a Tic Tac. I had to eat about 3 at once to get a sense of the taste. As for the flavor, it has the slight tang and sour flavor of pickled plum with a decent level of sweetness. It's an odd combo, but it works. In fact, it worked so well that I rubbed a sore spot on my tongue sucking on these things repeatedly. They're pressed powder and a bit abrasive so if you stupidly overdo it, like I did, then you're going to regret it. I was surprised at how much I loved these, but they may not "work" for everyone. Got to be careful as some of those ume candy can be quite strong. Mintia is quite well known in Japan and very popular. I miss Mintia so much! The flat packs were so convenient. We once found lemon-lime flavored ones that were delicious. I'm going to have to see if I can find some of those ume ones...YUM. I love the soda flavor Mintia.. :) Haven't tried the plum flavor though.